A vision of Hell from Dante’s Divine Comedy. 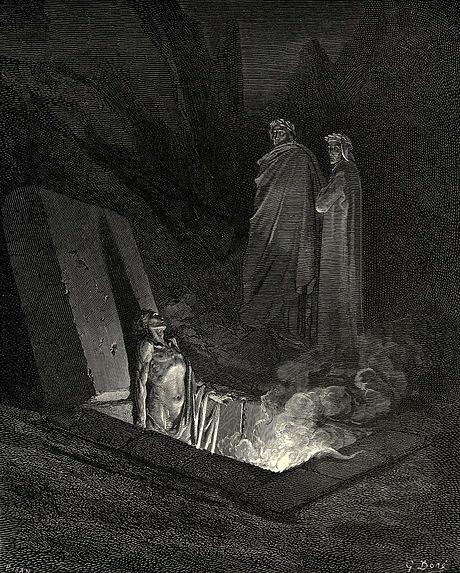 Illustration by Gustave Doré. But on the fourth night I cried, “To journey to Hell means to become Hell oneself It is all frightfully muddled and interwoven. On this desert path there is not just glowing sand, but also horrible tangled invisible beings who live in the desert. The way is only apparently clear, the desert is only apparently empty. It seems inhabited by magical beings who murderously attach themselves to me and daimonically change my form. I have evidently taken on a completely monstrous form in which I can no longer recognize myself It seems to me that I have become a monstrous animal form for which I have exchanged my humanity. But I cried out indignantly: “How frightful, it sounds like nonsense, do you also demand this of me? You overthrew the mighty Gods who mean the most to us. My soul, where are you? Have I entrusted myself to a stupid animal, do I stagger like a drunkard to the grave, do I stammer stupidities like a lunatic? I: “But our knowledge? Does our knowledge also not hold good for you? What is it going to be, if not knowledge? My soul: “Who gives you thoughts and words? Do you make them? Are you not my serf a recipient who lies at my door and picks up my alms? And you dare think that what you devise and speak could be nonsense? torments, spider-legged monsters, ridiculous, hideous, frightful theatrical spectacles. Come close, I am ready. Ready, my soul, you who are a devil, to wrestle with you too. You donned the mask of a God, and I worshiped you. Now you wear the mask of a devil, a frightful one, the mask of the banal, of eternal mediocrity! Only one favor! Give me a moment to step back and consider! Is the struggle with this mask worthwhile? Was the mask of God worth worshiping? I cannot do it, the lust for battle burns in my limbs. As the first vision had predicted to me, the assassin appeared from the depths, and came to me just as in the fate of the peoples of this time a nameless one appeared and leveled the murder weapon at the prince. I felt myself transformed into a rapacious beast. My heart glowered in rage against the high and beloved, against my prince and hero, just as the nameless one of the people, driven by greed for murder, lunged at his dear prince. Because I carried the murder in me, I foresaw it. Because I carried the war in me, I foresaw it. I felt betrayed and lied to by my king. Why did I feel this way? He was not as I had wished him to be. He was other than I expected. He should be the king in my sense, not in his sense. He should be what I called ideal. My soul appeared to me hollow, tasteless and meaningless. But in reality what I thought of her was valid for my ideal. It was a vision of the desert, I struggled with mirror images of myself It was civil war in me. I myself was the murderer and the murdered. The deadly arrow was stuck in my heart, and I did not know what it meant. My thoughts were murder and the fear of death, which spread like poison everywhere in my body. And thus was the fate of the people: The murder of one was the poisonous arrow that :flew into the hearts of men, and kindled the fiercest war. This murder is the indignation of incapacity against will, a Judas betrayal that one would like someone else to have committed. We are still seeking the goat that should bear our sin. Everything that becomes too old becomes evil, the same is true of your highest. Learn from the suffering oj the crucified God that one can also betray and crucify a God, namely the God of the old year. If a God ceases being the way of life, he must fall secretly. The God becomes sick if he oversteps the height of the zenith. That is why the spirit of the depths took me when the spirit of this time had led me to the summit. ~Carl Jung, Red Book, Pages 241-242. Previous Previous post: Carl Jung: But I’m absolutely positive that his feelings are still liquid. Next Next post: Carl Jung on the…………Esoteric.